1 of only 13 Siemens Automation Solutions Partners in the USA. MPE Machine Tool, Inc. has long provided quality Siemens Energy and Automation machine tool retrofits, including the Siemens 840D sl and Siemens 828D sl CNC controls as-well-as Siemens Step 7 PLC’s and Siemens S120 Servo Drive Systems. 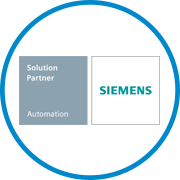 Years of providing quality installations and excellent customer service have earned MPE the designation of Siemens Solution Partner. We at MPE are proud to be so recognized by this world leader in CNC equipment. We are committed to honoring that trust by continuously improving our knowledgebase, tools and processes, so that our Siemens customers experience many years of trouble-free and profitable machine tool operation. We at MPE Machine Tool, Inc. look forward to serving you with world class Siemens Energy and Automation systems.